Gu Jun has been working in the field of ancient gardens and buildings for almost 40 years, after starting as a humble mason. At Pairi Daiza, a privately owned zoo and botanical garden in the Belgian city of Brugelette, China’s footprint goes beyond the resident giant panda. The ancient Chinese garden in the site exemplifies the artistic eye of Gu Jun, chief technical director of Shanghai Landscape Architecture Construction Co that designed and constructed the garden. “I am always very happy when I hear foreigners say that we Chinese people have great skills and are very clever,” he says. This year, Gu was named among the list of “Shanghai Standouts,” which honors residents who make outstanding contributions to the progress and profile of the city. Now 54, he has been working in the field of ancient gardens and buildings for almost 40 years, after starting as a humble mason. He took a job with Shanghai Landscape Architecture after graduating from high school. His first big challenge, which came before he was even 20 years old, was an assignment to work on a project reconstructing Daguanyuan, the fictional residential complex of a rich family in the Chinese literary classic Dream of the Red Chamber. Located next to the scenic Dianshan Lake in Qingpu District, Daguanyuan has since become a famous tourist destination in Shanghai and won a top national architecture award. Creating a garden from literary imagination was not an easy task for Gu and his colleagues in 1980. The team was responsible for building the Xiaoxiang mansion in the garden in the spirit of Lin Daiyu, its fictional resident. That meant capturing the essence of a beautiful, sentimental girl who died tragically when she couldn’t marry the boy she loved. All the team had at hand was a design drawing that only roughly marked the size of the mansion, without any reference to details of the roof, which was supposed to be the most aesthetic part of the building. 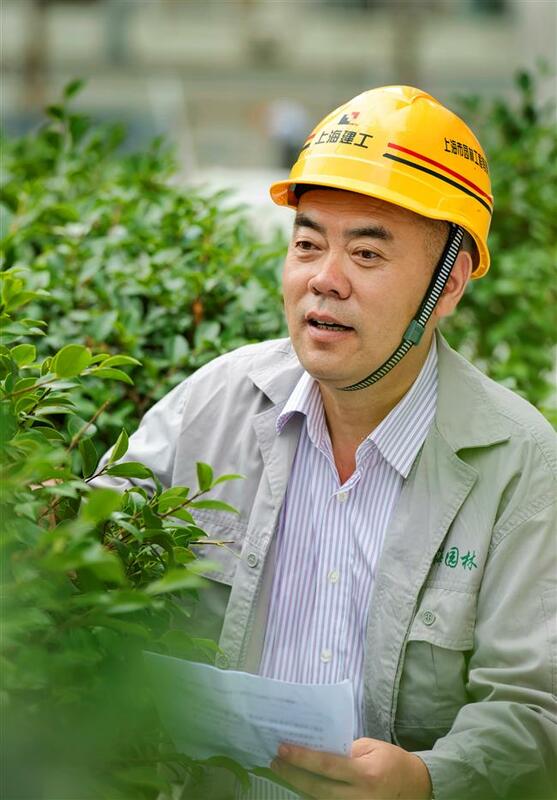 To overcome all these setbacks, Gu and his colleagues spent a month in Suzhou, a city studded with some of the nation’s most renowned traditional Chinese gardens. There, they made extensive drawings to perfect the design of the mansion. “We were able to finally get the height, the curves and other details of the roof right,” he said. 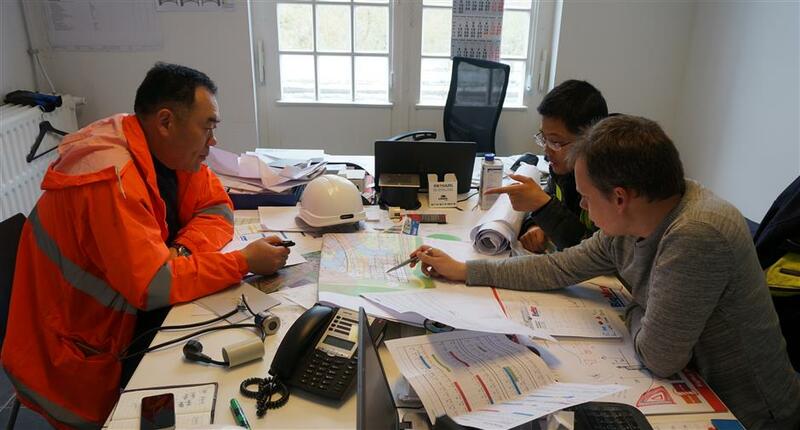 Gu Jun (left) discusses building plans with his team's Belgian partner. Another great challenge in his career was the renovation of Lu Bo Lang, an iconic building in Shanghai’s Yuyuan Garden. The wooden structure, built 400 years ago and now a restaurant, was in poor shape at that time. For Gu, it was his first stab at renovation work. In the mid-2000s, Gu found himself in Belgium, spearheading the design and construction of a traditional Chinese garden, including a replica of the Hu Xin Ting teahouse in Yuyuan Garden. Gu was technical director on that Pairi Daiza project, but he also managed the transportation of the building materials and the communications between his team and his foreign partners. One of the biggest challenges in the project was to recreate ancient Chinese-style buildings using traditional mortise and tenon joints, while still adhering to modern standards related to fire prevention, heat insulation and energy efficiency. A dropped ceiling and double layers of wooden floor were used to hide the heat and sound insulation systems in a restaurant in the garden. One month before the due completion date of the restaurant, the Belgian partners erected a 4-meter tall metal chimney on one side of the building. Everyone agreed that it stuck out like a sore thumb, clashing with the architectural style of the restaurant. Overnight Gu worked out a solution that pleased everyone. He proposed building a brick-and-mortar ancient Chinese tower to cover the metal chimney. He and three team members constructed it in just three weeks. “I told myself that more possibilities are opened when we add some twists to our traditional skills,” he said of the incident. The 65-hectare Pairi Daiza, built on the site of a 12th century abbey, is a popular tourist destination today. Its Chinese garden is the largest of its kind in Europe. Aesthetic appreciation can’t be measured. It exists only in the eyes of the observer, and the eyes of visitors to the garden have much to behold. They enter through a low arch in the shape of a full moon. The garden area itself is graced by topiary, ponds, cascades, mini fountains, temples, pavilions and elegant sweeping roofs with decorative figurines that peep out from the tips. Gu’s work continues a family tradition. He, a younger brother and a cousin all followed his father’s footsteps in joining the company. Today, Gu has between 40 and 50 apprentices. “I’m proud to pass down my skills, but more importantly, to pass on our cherished traditional Chinese culture,” he says. 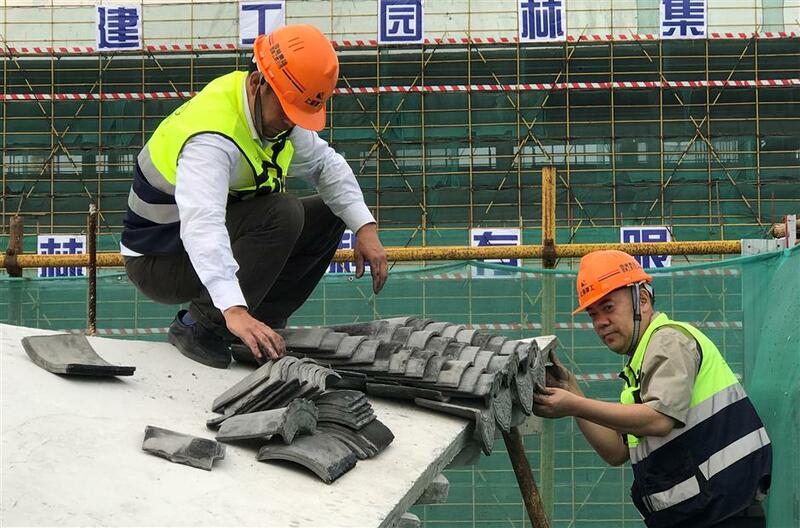 Gu Jun (right) checks that tiles are straight on an ancient Chinese-style rooftop.